The Arkansas State Capitol, designed and constructed over the course of some eighteen years, was the product of one political investigation, two architects, and three governors. The design falls clearly in the mode of American Renaissance capitols designed in the late nineteenth and early twentieth centuries. 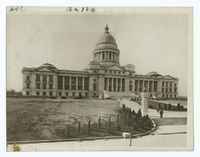 By 1899, Arkansas had determined that its early territorial capitol building was inadequate and authorized funding for a new building on the site of the state penitentiary. George Mann of St. Louis, who had placed second in the Minnesota Capitol competition and first in the Montana Capitol competition (although did not receive the construction contract), was awarded the commission on the basis of his earlier designs, at the recommendation of the governor and the Arkansas Capitol Commission. One of the commissioners, George W. Donaghey, a contractor by trade, was authorized by his fellow commissioners to “remain in continuous charge of the State Capitol work.” [Hitchcock-Seale-1976 p 232] By the time the cornerstone was laid in the fall of 1900, Donaghey had taken great animus to Mann, and spent the next nine years seeking to get him removed from the commission. 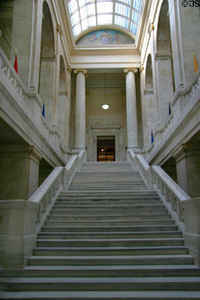 Construction proceeded, but in 1906 the legislature ordered an investigation into the qualities of the materials used in construction. Donaghey used the investigation as a political platform to run for governor and was elected to the position in 1908. 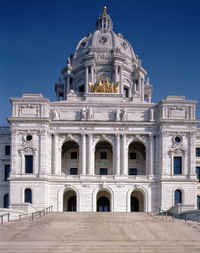 He finally forced Mann out in 1909, then set out to find a “practical man” to complete the capitol. Cass Gilbert was given the contract that summer. Construction continued along Mann's basic plan with modifications by Gilbert, according to instructions from Donagahey. 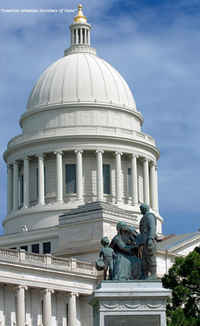 The most notable change was the substitution of Mann's dome with one that was based on the design that Theodore Link had devised for the Mississippi State Capitol (1901-1903). The building was finally completed in 1917. Henry-Russell Hitchcock and William Seale. Temples of Democracy: State Capitols of the U.S.A. (New York: Harcourt Brace Jovanovich, 1976).